In January, I wrote a piece called “To the Educators who will teach my Black Daughter [Gabby].” The majority of feedback was positive, but some was downright hateful. Some readers commented on my lack of attention to white children, claiming I am a selfish racist who cares only about the well-being of my own daughter. “What if I wrote a piece titled, ‘To the Educators of my White Daughter’?” one asked? Good idea. In fact, great idea. This is a critical conversation that we need to have. To address the readers concerned about my last column, I reached out to my friend and colleague, Matt; Matt is white and has a young white son. Matt’s son is Jack. He is three years old, a passionate, funny, brilliant, stubborn and caring kid. 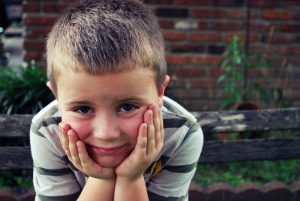 Jack will start pre-k next year at a local public school, and his father Matt wonders how Jack will experience what will soon be a huge part of his life: How will public school affect Jack's self-esteem, his intellectual and emotional well-being, and his safety? What will public school teach him about how to treat people? Whose voices will have value? How will his experience as a white male i nfluence those conversations? perience education: biases of race, gender, class, ability and religion to name a few. Biases, both implicit and overt, play out in classrooms and schools every day and as teachers, we try to minimize them. As parents we feel particularly concerned about the interconnectedness of our children and everyone else in the world. We want them to feel unique and special, but also a part of something larger than themselves, something that binds all of humanity together. We would like Jack’s teachers and all teachers to recognize the great potential they have to influence our nation by helping our young people to celebrate themselves and others and to live in harmony with those who are different from them. I’d ask you to go back through history and figure out where are the contributions that have been made by these other categories of people that you are talking about. Where did any other [non-white] subgroup of people contribute more to civilization? We need our country—especially its leaders— to acknowledge the contributions that non-white populations have made and their own attempts to relegate anyone who is not white to a status of secondary importance. This lesson cannot be ignored. White boys are leaders. Textbooks are full of pictures of white men. Because of this utter lack of representation, it is important to remember that white boys are not the sole proprietors of leadership, even if our national leadership would have you believe otherwise (Note: See 44 of 45 presidents and 45 of 45 vice presidents). Educators should provide opportunities for all students to develop their leadership skills. Learning to lead is not about holding one’s self in a position of superiority. Teach them that true leadership also bears the responsibility of questioning the makeup of governing bodies where everyone looks just like them. Leaders understand the value of diverse representation and voice. White boys need you to be honest about their history. We cannot fully embrace the contributions of white people without representing the hard truths. Teachers, do not shy away from any of it. As you teach about the strength and resourcefulness of our founding fathers, include the horrors of the exploitation and destruction of other cultures and civilizations they also engaged in and the ways these actions manifest themselves (and persist) in our current society. Help white boys think critically about the impact of this history. Help them discover their potential for advocacy, allegiance and leadership with and for those who society attempts to force into the margins. White boys want to understand the world beyond the one in front of them. Grant them opportunities to learn about the influence of, and beauty present in, cultures, customs and religions other than their own. Teach them to value and respect those just as you would teach them to embrace their own. Teach them about Africa. 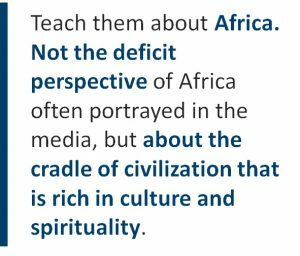 Not the deficit perspective of Africa often portrayed in the media, but about the cradle of civilization that is rich in culture and spirituality. Open their eyes to every possibility that time will allow. 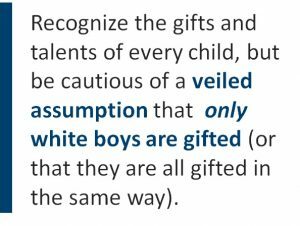 White boys need to see and study all people equitably. Consistently provide a broad scope of exposure and learning about all people and cultures. Be sure not to relegate the contributions of any group of people to just one month. Don’t only read texts written by white Europeans. Let them interact with Okonkwo, Mama Elana, Amir and Precious Ramotswe. Let white boys learn of what they have in common with them. White boys are resilient. Let them demonstrate resilience through engaging in difficult conversations with respect to race, gender, class, ability, religion and orientation in school in meaningful ways. Provide opportunities for them to listen to the experiences of other students and learn that no one’s, including their own, lived experience should ever be diminished. Remember that demonstrations of resilience should be supported with care and compassion. Dear Educators, please SEE MATT’S SON. Know that there are things that you need to attend to for Jack that you will not have to attend to for my daughter Gabby and vice versa. Be prepared for these differences. Look at him. Teach him. Challenge him. Learn with him. Be honest with him. If you do, he will learn that you are a trusted part of his community, and he will know that you carry that lauded responsibility each time he enters your classroom. 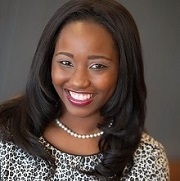 Jemelleh Coes is the 2014 Georgia State Teacher of the Year, and she is on the Board of Directors for the National Network of State Teachers of the Year (NNSTOY). Matthew Moulton is the graduate student representative for the Middle Level Education Research Special Interest Group for the American Educational Research Association. They both serve as supervising instructors for teacher candidates in the middle grades program at the University of Georgia, Athens.